Are you troubled by the question of "What to do with a six pack gift box of Toblerones?" The obvious answer is to eat them. By putting them up in the cabinet, they are out of sight and out of mind. Except for the one that I melted and used for ice cream topping. So now you know three things to do with a Toblerone: 1) eat it 2) melt it over ice cream 3)bake with it. Pondering what I could make with them without having to go to the store, I settled on using my recipe for butterscotch blondies, but replacing the butterscotch with Toblerone. They aren't very blond, but they are moist and yummy. Now, what to make with the leftover peanut butter cups from Halloween? Heat oven to 350. Line a 9x13 pan with foil and lightly spray with cooking spray. Beat butter and sugars in large bowl until creamy. Add eggs, beating well. Stir together the flour, soda and salt in a small bowl. Gradually add flour mixture to butter mixture, blending well. 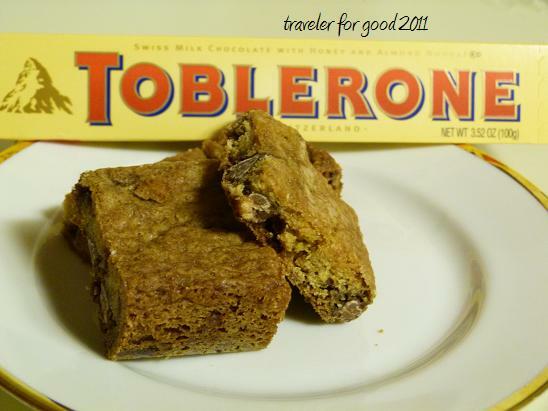 Stir in Toblerone and spread into prepared pan. Bake 30 minutes (Colorado time) until golden brown. Cool, use foil to remove from pan and slice into pieces of your choosing (large for you, small for your friends). I've still got 3 more Toblerones to go.